Cider is no longer the syrupy sweet, gluten-free backup dancer to beer it once was: Funky, dry, complicated ciders made in the European tradition are enjoying a very well earned place towards the front of the stage, and for good reason. As Leslie wrote, funkier, drier, more orchard-focused ciders are just as interesting as wine, if not more so, and I drink them exactly as I might drink wine. Albert Wilklow of Bad Seed Cider in his apple orchard. Because it shares so many characteristics with wine—from its bright fruitiness and slight sweetness to its balance of tannins and acidity—it follows that cider would make an excellent cooking liquid, and it does, in just about every application you can think of. In fact, "You can sub in a dry cider wherever you might use a white wine in a dish," said Devin Britton of Bad Seed Cider, a cidery in New York's Hudson Valley. He and his business partner, Albert Wilklow, started cooking with cider because they often had opened bottles of cider left over from cider tastings; cooking is a good way to use up cider that's gone flat, but it's just as worthwhile to open a fresh bottle. "Cider is a little bit warmer in flavor than white wine," Devin told me, which makes it a good choice for holiday cooking. Just be sure to look for a cider without added sugar, so as to prevent over-caramelization or burning and to highlight the cider's flavor. He poaches fish, steams clams and mussels, and braises meats (like chicken with apples) in cider; and in their tasting room at Bad Seed, they make a bacon and brie grilled cheese with a tangle of onions caramelized in cider. 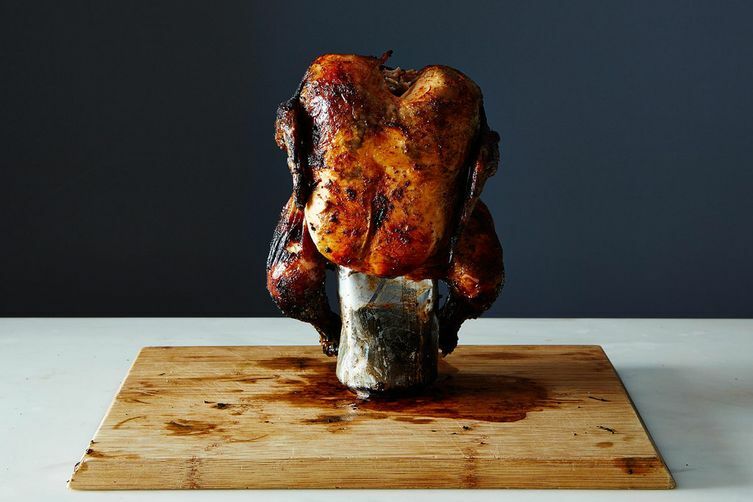 Another of Devin's favorite uses: "Substitute the beer can in a beer can chicken for a can of dry hard cider. It's so good," he told me. I believe him. Swap cider for the white wine in Mussels Dijonaise—or get these Drunken Clams drunk on something new. Cider would bring out the apples and fennel in this farro risotto, and the earthiness of the mushrooms in this creamy pasta. Chicken and apples is a natural pair, whether as Chicken Kiev or in a roast chicken's pan sauce. Let cider compliment the sweetness of the balsamic in this braised lamb recipe. Steam simple brussels sprouts in it. Use a flat bottle of cider to make a post-party granita. Have you cooked with cider before? Tell us your favorite uses for it in the comments! hi AJ—that sounds quite good to me! especially if you're making the rich with a deeply flavored chicken or vegetable stock. let us know how it goes if you try it! Thanks, Caroline. Yes, I'll be using an uber-rich turkey stock, made with roasted necks and backs, lots of aromatics, etc. I'll probably use toasted almonds instead of pecans, given that pecans are always featured in at least one, if not two pies.